Resource Center What Are Opiates? 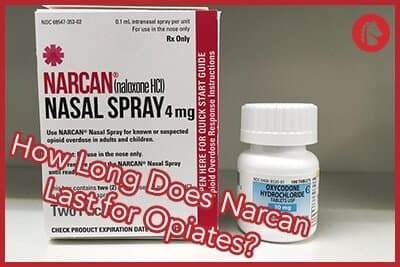 How Long Does Narcan Last for Opiates? For people who work on the front lines of the fight against addiction, Narcan is an incredibly valuable weapon. This medication could help to save lives, and there are many lives that need saving right now. The Centers for Disease Control and Prevention reports that about 115 Americans die each day due to opioid overdoses. Numbers like this demonstrate that we’re dealing with an epidemic of prescription drug and illicit drug abuse. Narcan, with its ability to block the power of opioids, could be part of the solution, but this drug must be paired with rehab in order to be truly effective. The brain is ruled by a series of chemical and electrical reactions that help us to think, feel, and act. Opioids work on a pathway that helps to elicit feelings of relaxation and pleasure. Opioids, also known as narcotics, attach to receptors and trigger the release of the chemical dopamine. This chemical is used by the brain to signal a pleasurable activity. When dopamine is present, it typically means that something wonderful is happening. This reaction was crucial during the evolution of humankind. We needed to know what was good for our survival and what we should look for again. Dopamine helped to make the good things memorable. Since opioids work on that dopamine system, they help people to feel relaxed and joyful even if they’re enduring something painful. That’s why opioids are considered effective painkillers, says the American Society of Anesthesiologists. They help to block pain signals. They’re sold under different brand names at different strengths, so doctors have options when they need to treat patients in pain. But some prescription painkillers are much stronger, and more dangerous, than others. For example, the United States Drug Enforcement Administration reports that fentanyl is 50–100 times more potent than morphine, and just 2 milligrams is a lethal dose for most people. Street drugs like heroin are also in the opiate family, and they also work on the same dopamine pathways. These drugs can also come with divergent strengths, and sometimes, people get drugs without really understanding how strong they are. This matters because opioids can also slow down breathing rates. People who are relaxed tend to breathe slower than people under stress. If the opioid dose is too high, people can breathe so slowly that the brain does not have enough oxygen to support consciousness. People can faint, and their breathing can continue to slow. People can die due to this process, and it is an overdose. Any medication in the opiate class can cause an overdose. In a study in the journal Drug and Alcohol Dependence, researchers found that the overdose death rate from prescription painkillers in 2009 was 6.05 in 100,000. The overdose death rate from heroin was 1.43 to 100,000. These rates demonstrate how dangerous opiate substances can be. Narcan is meant to help. Opioids rely on a connection to receptors in order to trigger a release of dopamine. Narcan works by blocking those receptors. As the National Institute on Drug Abuse explains, Narcan is an opioid agonist. That means it has the ability to connect and bind to opioid receptors, which can block the effect of opioids. Narcan is a prescription form of the drug naloxone. In the past, this drug was available only by needle. In an overdose situation, medical professionals had to draw the proper amount of the drug, find a healthy vein for injection, and plunge a needle into that vein. This was something only qualified medical professionals could do, and a lot could go wrong. Narcan is different in that it is packaged in dose form. Each bottle contains one dose, so there is no need to determine how much to give. The bottle is preloaded. Instead of finding veins and using needles, Narcan can be sprayed inside nasal passages. Since there is no need to determine dosages, and there is no need to use needles, the U.S. Food and Drug Administration (FDA) says anyone can offer the medication to someone in need. Even a child could deliver the dose, the FDA says. Narcan should take hold and find receptors to block the action of opiates in about 2–3 minutes, the drug manufacturer says. The medication stays active in the body for about two hours. One dose may not be enough to help someone in the midst of an overdose, so the drug is typically packaged with two doses. If someone doesn’t revive after the first dose, another can be given. If the first dose wears off and the person begins to exhibit overdose symptoms again, another dose can be given. While anyone can give Narcan, medical professionals need to step in and take over at some point. Opioid withdrawal is unpleasant, and for some people, it is life-threatening. There is a risk of choking on vomit, and longstanding vomiting can lead to dehydration. 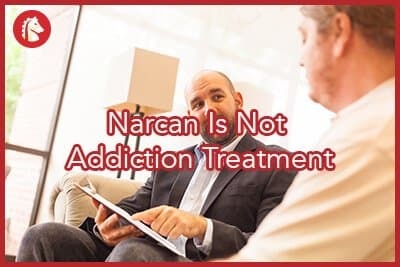 Narcan can also wear off before all of the opioids in the person’s system have been processed. That means people who have one, two, or even three doses may still lapse back into an overdose. When the Narcan’s blocking impact tapers off, the drugs can latch back on and cause another flood of dopamine. In an article in the journal Clinical Toxicology, researchers suggest that most people need to stay in the hospital for about an hour after they’re given Narcan for an overdose. That allows medical teams to watch over their patients for a relapse to overdose symptoms. It also allows teams to give therapies to soothe discomfort from opioid withdrawal, so no life-threatening side effects occur. It can be hard to discern whether someone has truly overdosed or is just extremely relaxed after a big hit of drugs. Addiction experts quoted in an article in The New York Times suggest a sternum rub. Pressing knuckles against the breastbone and rubbing up and down with force should produce pain, and it should cause the person to wake up. If not, this could be an overdose, and giving a dose of Narcan could be wise. In many communities, people who live with someone addicted to opiates are encouraged to keep Narcan on hand. That way, they can provide the medication if the person they love slips into an overdose. After that dose is given and the person wakes up, calling emergency responders should be the next step. Ambulance drivers should have medications like Narcan on board, and they are equipped to provide medical monitoring. They can offer the medication in the ambulance on the way to the hospital if needed. They can also call the hospital in advance and let medical teams there know that a patient is coming. The ability to block the power of opiates and pull people back from an overdose is simply remarkable. People describe seeing their friends turning blue and dying right in front of their eyes, and then watching them jump back into life seconds later after Narcan. This is a drug that saves lives. Narcan is also a drug that is given very frequently. In 2014 in Ohio, for example, nearly 13,000 overdoses were treated with Narcan. That number may rise, as the opiate epidemic continues. While Narcan has the power to save people from one overdose, it does not impact the way the mind works. It does not have the ability to help people change their thoughts about drugs. It cannot help people to avoid the next overdose. Only addiction rehab can do that. After an episode halted by Narcan, families are in an exceptional position to discuss the real price of an addiction. A person who just went through an overdose episode may have experienced the jarring moment of awakening while surrounded by panicked people, all of whom are glad the person is alive. It may feel like death was near, and it isn’t at all uncommon for people to feel fear or even terror about what just happened. Families can discuss how addictions can be deadly, and they can talk about how therapy helps. During a medical detox program, which is vital for people addicted to opiates, people can move through withdrawal symptoms while under the care of medical professionals. They can get help with symptom severity, so they can get sober without losing their lives or their will. This process takes weeks to complete, and when it is over, those successes can continue in rehab. Avoid situations that raise relapse risks. Express their feelings about drugs honestly. Find sober allies who can help them through episodes of stress and fear. Use meditation to calm difficult emotions. Build a life that supports exercise, sleep, and good nutrition, so the body and the mind will stay healthy. Opiate recovery is a process, and it’s one that never really ends. Addictions are chronic, relapsing conditions that are built on the back of changes in brain chemistry. Relapse is always a risk, but rehab can help people to manage that risk, so there is no need for Narcan in the future. Families can have this discussion and instill that hope in the immediate aftermath of a Narcan rescue. They can build on that success as they walk through rehab with the person they love. In time, they may look on that rescue as the moment when everything changed for the better.